All transactions are safe and secure with a reliable history in online purchasing behind each of our associates. Buy the Cooter's Garage Dukes of Hazzard t-shirt to own Dukes of Hazzard clothing and merchandise. 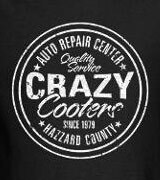 This Cooter's Garage Dukes of Hazzard tee advertises the shop of the best mechanic in all of Hazzard County. The circular logo appears on the chest with the name of the garage in white text. Below the logo also in white text is the location of the shop, Hazzard County. "Crazy Cooter" is his CB handle that he uses when talking to Bo and Luke. In addition to the Cooter's Garage Dukes of Hazzard tee above, browse the Dukes of Hazzard Clothing Gallery for more apparel like men's and women's clothes, kids shirts or hoodies.